At Serenity Rejuvenation Center, Dr. O’Connell are proud to introduce miraDry as a treatment to resolve excessive sweating, as part of our mission: Improving the Quality of Life of Our patients Through the Art and Science of Medicine. Imagine a lifetime of freedom from antiperspirant, deodorant, shaving, and being faced with replacing your favorite clothes due to sweat stains. You can finally be free from this embarrassing problem with miraDry treatment at Serenity Rejuvenation Center! We offer a groundbreaking treatment to reduce underarm sweat, odor, and hair for the long term. This FDA-cleared treatment produces immediate results as little as one treatment. If you are one of the many people who suffer from excessive sweating, miraDry produces an almost miraculous improvement. If you are unable to go for a walk on a crisp afternoon without excessive sweating, or work in an air-conditioned building and still sweat excessively, or if your underarms sweat to the point your clothes are soaked, you likely have a medical condition called hyperhidrosis. Dr. O’Connell at Serenity Rejuvenation can help you live a happier, more confident life. Our team in at our private Bellevue clinic can bring you relief, at last. When ordinary antiperspirants don’t work, you might want to explore medical treatments such as miraDry for hyperhidrosis, odor, and underarm hair. Hyperhidrosis is the clinical name overactive sweat glands. While it is necessary to sweat to keep the body cool, with hyperhidrosis, the body sweats profusely even when the body does not need cooling. 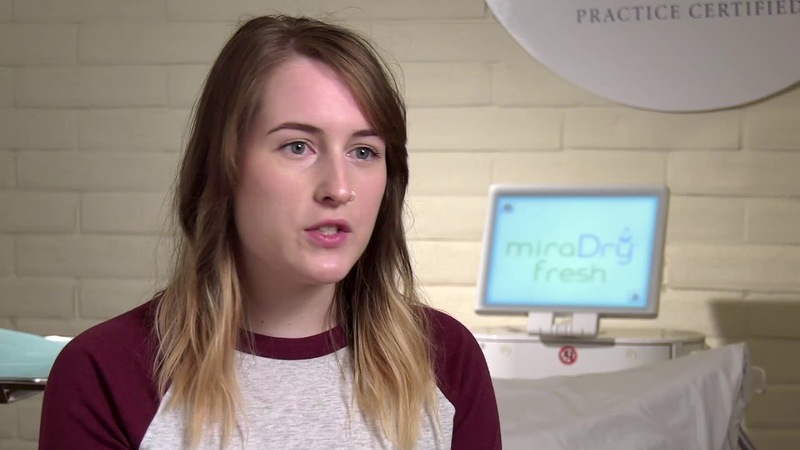 miraDry is a safe, FDA-cleared, non-invasive, lasting solution to resolve hyperhidrosis. Using microwave technology, miraDry delivers heat waves as hot as 140 degrees Fahrenheit just below the skin surface, and at the same time, a cooling device prevents the upper layer of skin from burning. The controlled delivery of energy turns off your sweat glands for a lifetime. Am I a good candidate for miraDry? The best candidates for miraDry are those who feel embarrassed by excess sweating. If you have tried all types of deodorants and find yourself reapplying multiple times throughout the day to no avail, miraDry might be the right choice for you. The best way to find out is to schedule a consultation. Our professional staff at Serenity Rejuvenation in Seattle will meet with you to discuss your questions and concerns; we will consider your medical history and then help you determine if miraDry is right for you. If you need a solution for excessive and uncomfortable sweating that resolves the problem for a lifetime, call our office to arrange a miraDry consultation. As a board-certified medical doctor, Dr. O’Connell performs his life-changing procedures with meticulous care and a focus on patient safety and health. With extensive research, clinical training, and deep experience, Dr. O’Connell uses the most advanced, effective treatments to assist his patients to achieve a better quality of life. miraDry, an FDA-cleared procedure, will be performed in the comfort of our Bellevue office. Dr. O’Connell will begin the processes by measuring your armpits and marking the treatment areas. Lidocaine will be applied to both armpits to provide a more comfortable experience during your procedure. The number of shots necessary will vary from person to person, but you can expect around 30 shots. Once numbed, the miraDry device is applied to destroy the underarm sweat glands. The procedure should take approximately one hour to complete. After a miraDry treatment, you may experience a minor soreness or swelling. This is entirely normal and ice packs can help to reduce the swelling or discomfort. It is important to give yourself a few days of downtime to relax and heal. The recovery period is short, but don’t plan any big work meetings or activities directly after your procedure. You will experience immediate results with miraDry – no more underarm sweat. MiraDry is a revolutionary non-surgical treatment that is FDA-cleared and is clinically proven to resolve the problem of excessive underarm sweat, odor, and hair in just one hour. 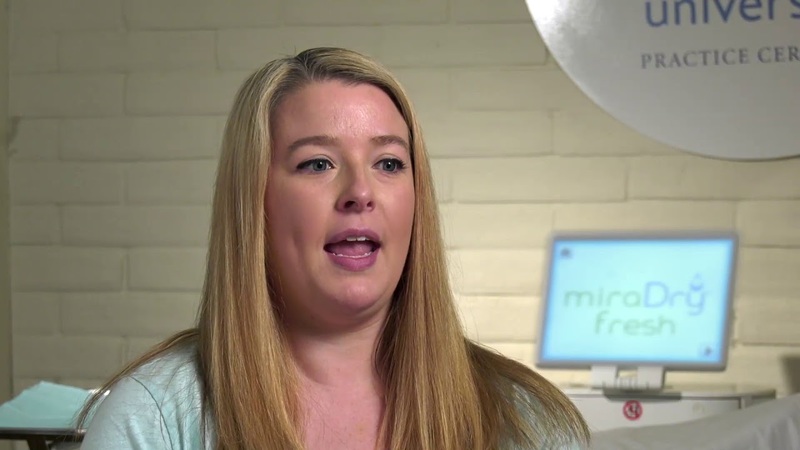 Over 100,000 miraDry treatments have been performed worldwide. The miraDry treatment works by delivering targeted thermal energy (specifically microwave wavelengths) to safely eliminate sweat, odor, and hair. Alternative options, including antiperspirants contain toxic chemicals including aluminum which stain the materials in which it contacts including clothing. The active ingredient in most antiperspirants (aluminum) has been linked to various health problems. BOTOX injections are an effective treatment for hyperhidrosis, but requires repeat treatments to your sweat glands, typically every nine months or sooner. While your body does need sweat glands to cool itself, your body contains two to four million sweat glands, with approximately 2 percent in the underarms. Treating the underarm sweat glands does not negatively affect your body’s ability to cool itself. The treatment is typically complete in one hour and results can be achieved in as little as one treatment. A small percentage of patients have will need a second treatment to fully resolve the problem. However, as with any medical procedure performed at Serenity Rejuvenation Center, Dr. O’Connell will work closely with you to achieve the relief you need. The sweat, odor, and hair addressed with miraDry is gone for good. Since local anesthesia is administered prior to treatment, miraDry treatments are typically pain-free. You may experience some localized soreness and swelling, which typically resolves fully within a few weeks. If you would like a long-lasting solution to your excessive sweating, contact our office and arrange a MiraDry consultation. Serenity Rejuvenation Center and Dr. O’Connell will be happy to help you eliminate sweat, odor, and hair in your underarms to bring you relief – and improve your quality of life.